Once again, we needed some quick food that the kids were willing to eat. You see, we were scheduled to leave on a 6:30am flight the next morning. That meant a super early bedtime for everyone. In theory at least... 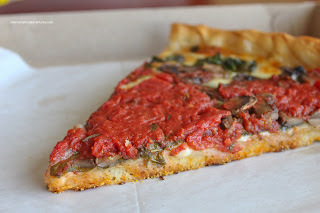 Try to get 2 wired kids to go to bed at 7:00pm... Anyways, the decision was to pick up some pizza from Lefty's Chicago Pizzeria just down the street from Urban Solace. This was the second time we had swung by for some pizza for the kiddies on our trip to San Diego. The first time was at Bronx Pizza which, as the name implies, NYC-style pizza. 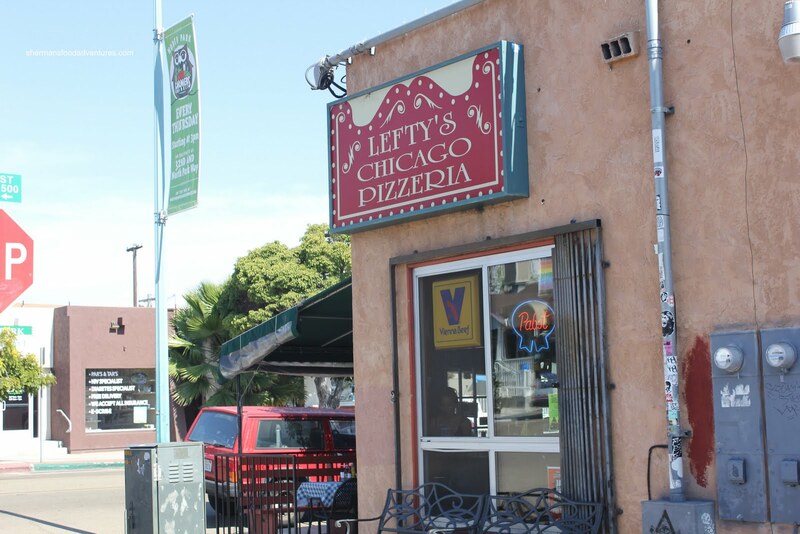 Similarly, Lefty's Chicago Pizzeria pretty much sums up what they serve - de ep-dish pizza. However, for the kiddies, it was plain ol' Cheese Pizza (on regular crust). Well, what can I say, it was a pretty solid slice. The crust was of medium thickness and crispy on the bottom. Lots of cheese on top. The kids seemed to like it. For Viv and I, it was all about the deep-dish. 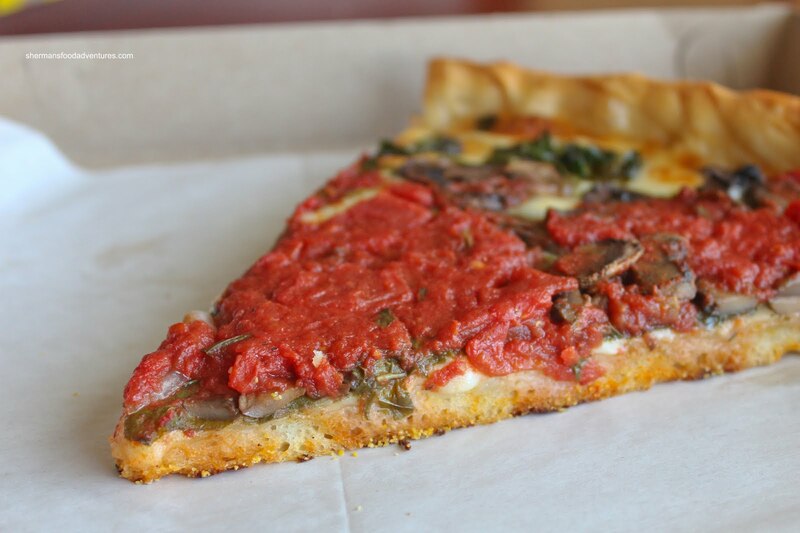 Although I'm not a huge deep-dish fanatic, there are times I want the crust to be thick and the toppings aplenty. They have 2 different types of deep-dish here and since we could not finish a whole pie ourselves, I resorted to ordering what was there, which was the Sausage and the Spinach & Mushroom. These were the regular deep-dish, not the stuffed which would have another layer of crust in between the toppings. The first thing I noticed was the really tasty chunky tomato sauce. It was there for all to see and also there for my tastebuds. Lots of tang and tomatoey texture. The crust was not really that thick which suited me fine. It was crispy and the pizza slice was fulfilling. Naturally, I preferred the meat pizza over the vegetarian. 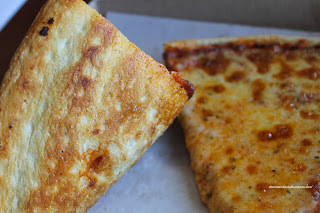 Now, by virtue of being a reheated slice of pizza, it was difficult to do an accurate assessment of the pizza at Lefty's. I'm sure the fresh whole pies would be even better since it would probably be less dry. For someone who is not a deep-dish fan, I kinda liked the pizza at Lefty's.